Learn to Lock Keyboard and Mouse in Windows laptop or computer as well as unlock quickly especially when you are away from your PC by using special software. We often have to go out while doing important work on our computer, for this, we either down Lid of a laptop or make it temporary logged off. But there is the chance that we have to hurry to receive a call or to move from one table to another, and have got not enough time to lock the computer by pressing Win + L keys. Moreover, when we are at home, the children may interrupt the working by deleting the file or pressing the backspace key to delete the data or any other activity, so there should be an option that they are only able to view the computer screen while keyboard and mouse are locked. Although, there is software through which you can make a spy on your co-workers and children while they are near the computer. But we still need some kind of software to lock keyboard and mouse temporary. In this tutorial, you will find easy ways to lock the keyboard and mouse to keep your system data safe from manually delete or interrupted by someone especially when you are away from your PC. It is also worth mentioning that the software will only help to lock keyboard or mouse temporary. Although there is much software to protect or lock your computer screen by making your computer keyboard lock, I will describe that are easy and free to use. This Free software is easy to use, you don’t need to install it rather than just download the software and run its exe file. Once launched, you have to enter a Password to Unlock and Lock Keyboard and Mouse. By default the Password is “cake”, but you can change it later whenever you want. The best thing is the Computer Screen will be alive and you can move the mouse pointer, but will be unable to click. As by name this software was primarily designed for the parents to lock keyboard and mouse for children but will for other persons while using Windows 10 or earlier versions. Time Limited or Auto Lock: Lock keyboard for the specific time and will unlock it automatically. Manual Lock: Lock keyboard and mouse manually and will keep them freeze if want to use keyboard and mouse again just press Shift+Alt+End. Click Allow Only: This mode will keep Mouse locked and you will be able to lock only a few keys of the keyboard, like Page up, Page Down, Space. This feature will help when you want to limit the use of keyboard to your children. Block Win Control: Click Block Win Ctrl to block only control keys, i.e. Ctrl, Alt and Win key. It is worth mentioning that even when you lock keyboard or mouse the user can access Ctrl+Alt+Delete to open taskbar and restart the windows again. After downloading the program, you will be able to install it by pressing its exe file. Right Click its icon in the system tray to lock keyboard or mouse quickly. You can lock the keyboard or the mouse or both by accessing its system icon. To unlock the Keyboard or mouse in windows, press Ctrl+Alt+F, you can also set a combination of keys on your own. You can also block the mouse movement or even hide it from the screen by using the appropriate settings from the system icon. 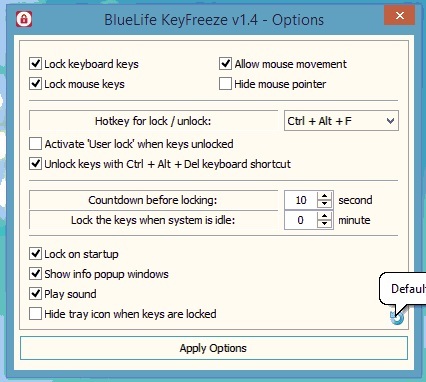 Although, after locking keyboard or mouse by using this software, if someone tries Ctrl+ Alt + Del option then it will lock the computer. However, you can not stop someone by pressing the Power button to restart the computer. In that case, you may lose any important unsaved data. The above-mentioned apps cannot stop someone by pressing the Power button to restart the computer. In that case, you may lose any important unsaved data. So to keep your data and computer secured, it is advised to use a Microsoft account along with using the above to lock keyboard or mouse. Really very interesting tips………..Thanks for sharing this Guide…..!! Here we found most of the information very useful. this information very useful for us. Thanks for sharing this good post.